Does your dog sprawl in the sunniest spot in the yard, soaking up the rays? Will your cat follow the patch of sunlight around the living room all day? If so, it’s possible that even the furriest fur baby can get sunburned, just like you. Even indoor pets can be burned when certain UV rays pass through open windows or glass and penetrate the skin. Over time, excessive sun exposure can cause irreversible skin damage and even lead to skin cancer in dogs and cats. Doesn’t the Fur Block the Sun’s Rays? Yes — to a degree. But like light-haired, fair-skinned people, dogs and cats with white, light or thin hair and less skin pigmentation may be more likely to sunburn. 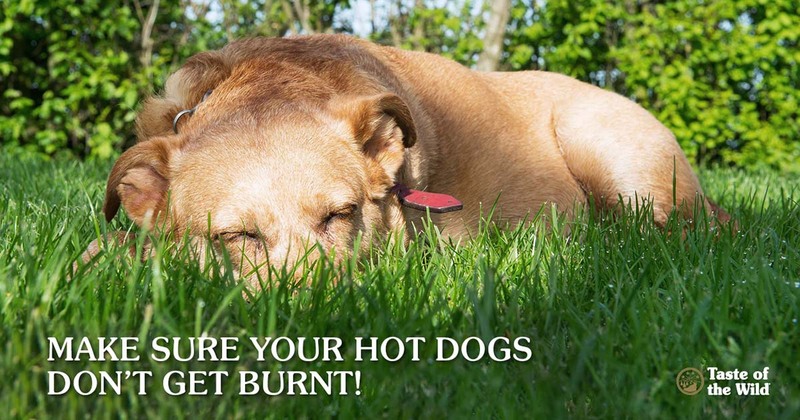 Dogs that may be prone to sunburn include Dalmatians, boxers, American Staffordshire terriers, bull terriers, bulldogs, whippets and breeds with little or no hair, such as Chinese crested dogs. Dogs and cats living at high altitudes or those who beg to be outdoors all day may also be at risk of burning. So if you’re taking your dog hiking in the mountains, be prepared. And if you shaved your pet to be cooler in the summer or had patches shaved for a surgical procedure, guess what? That exposed skin is at risk. Same goes for pets with hair loss from allergies or disease. Areas of skin with little or no hair, such as around the lips, the belly, lightly colored noses and the inside of the legs are more susceptible to sunburn. Cats may feel the burn on their ears and faces. Like people, sunburned pets may have pink, reddened skin that’s tender to the touch. The trouble is that other conditions, such as allergies or skin infections, can cause similar signs. Often, owners don’t notice the signs until the damage progresses and the pet experiences hair loss, roughness or thickening of the skin or even irregular growths. If you suspect your pet may be sunburned, contact your veterinarian for advice. Avoid direct sunlight when the sun is most intense. In the U.S., that’s typically between the hours of 10 a.m. and 4 p.m. from April to October. Either keep your pet indoors (and away from windows) or make sure your pet has a cool, shady spot outdoors during those times. And remember, pets can still be at risk of sunburn in the winter when sun can reflect off snow and ice. Find a pet-safe, waterproof, topical sunscreen with an SPF of 15 or greater. Ideally, look for a broad-spectrum product that blocks both UVA and UVB rays. UVA rays can pass through glass and penetrate deeper into the skin than UVB rays, potentially contributing to skin aging and skin cancers. UVB rays tend to damage the skin’s more superficial layers, leading to sunburn and skin cancers. Avoid sunscreens that contain zinc oxide or salicylates, which can be toxic to dogs and cats if they lick their skin. Ask your veterinarian to recommend a brand of sunscreen that’s safe for pets. If possible, apply the sunscreen 30 minutes before sun exposure to the nose, ear tips, around the lips and to areas with little or no hair. Make sure to reapply the sunscreen every few hours or as necessary. Shop for pet accessories with built-in UV protection. These include Doggles, to help protect the eyes from UV rays, as well as clothing and even pop-up tents. With the right precautions, you can still make the most of the great outdoors with your pet — without getting burned.